While skipping out of much of high school, Charles was seduced by a life of crime through a Milwaukee street gang. Originally from Chicago, Charles moved to Milwaukee in 1987. He went to Kosciusko Middle School, then Pulaski High School and, though he enjoyed school, he was not fully committed. He said, “I was there, but I wasn’t there.” His dad wasn’t there either and the other “role models” in his life only shared with him their experiences with drugs and gangs. His grandmother was doing all that she could to help him succeed, but what he really needed, he said, was a positive male role model. “I started at Literacy Services probably 20 years ago at 27th and Wells. That’s when I passed my GED reading test, but I never really completed the program. After that I dropped out. I got into more trouble,” Charles recalled. Charles now knew he wanted to do well. He just didn’t know how to do well. What he did know, though, was that he wasn’t going back to jail. He worked various jobs here and in Green Bay before returning to Milwaukee four years ago when he discovered he had a daughter. Now he had a strong and positive reason to succeed. Nearly two decades had passed since his first class at Literacy Services of Wisconsin, but this didn’t deter Charles. He was going back to get his GED at last, to improve his life, once and for all. His goal was to be a great dad and a strong community leader. He had finally found his calling, his passion. 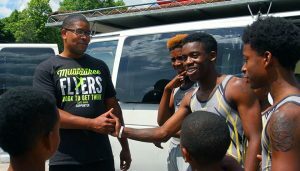 He would work with Milwaukee’s youth and use his own experiences – and mistakes – in growing up on the streets to help them see that there is a better way – through education. 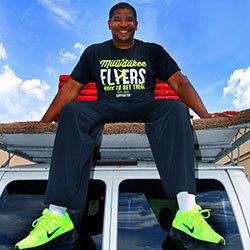 “I knew I was going to need more education in order to take Milwaukee Flyers to a higher level. I knew I wasn’t illiterate or dumb, but I also knew I needed to get to college to work on business management and communication skills,” he said. Charles started GED classes in June of 2012 and studied hard. He received his GED with LSW’s largest class to date and by January of 2014 had enrolled at Milwaukee Area Technical College. He is now pursuing a business degree. One of his first contacts at LSW was GED Director David Peters. Charles calls him a “phenomenal GED instructor” but also a mentor, motivator, and a father figure. “When I missed class, he would call and say, ‘Hey, Charles, just calling to check on you.’ He kept pushing me, kept supporting me, and always made me feel welcome and warm. I love that whole experience down there. I had all these different tutors that worked with me personally on math and science and writing. You build that bond,” he said. The qualities he saw in David and his tutors are the qualities he wants to bring to his leadership of the Milwaukee Flyers. Charles shares his experiences at Literacy Services and the importance of education not only with his daughter, now 4, and the Flyers, but also with old friends who have not yet figured out how to escape the negativity that still plagues them through gangs and drugs.